We think the staff at Temme English Maldon were as delighted as David (pictured here) when his purchase completed. David was excited to be collecting the keys to his lovely new home in Tollesbury. The branch staff were over the moon to mark the first completion for the companies newest office. Within all our branches the staff at Temme English pride themselves on being pro-active and service driven. Our many five star reviews across Google, Feefo and Facebook reiterate this along with the reassuring company policy of a no tie-in contract. 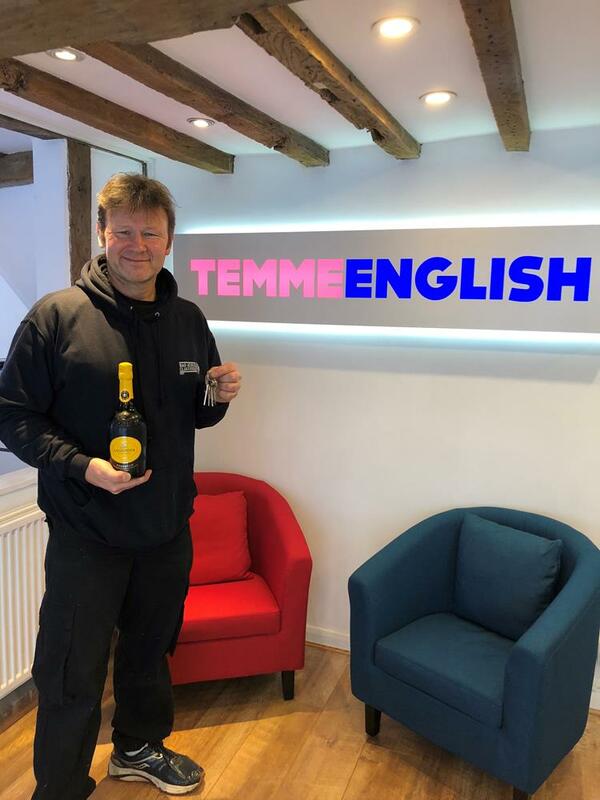 Temme English Established in May 2010 by partners Carl Temme and Steve English, Temme English are multi award winning professional sales and letting estate agents in Basildon, Colchester, Maldon and Wickford in Essex. As an independent business, our success depends entirely on delivering high quality service and excellent results for our customers and clients and we place you at the heart of everything we do. Our well sited offices are open long hours, seven days a week. Maldon is a gem of a market town that nestles on the banks of the Blackwater Estuary in the county of Essex. It can trace its roots back to the iron age, but is perhaps most famous for its salt marshes and the Battle of Maldon, in which Ethelred the Unready’s army was defeated by the invading Vikings in 991 AD. Maldon’s sheltered location made it the perfect natural harbour and, over the centuries, it thrived on fishing and the steady flow of goods to and from London. These days, though, the harbour is more popular with day-trippers coming for a day out on one of the many sailing boats and Thames Barges than for trading or fishing. And, the town itself has grown considerably from its early beginnings – from the 180 inhabitants recorded in the Domesday of 1086, to over 15,000 people today. At its heart is the bustling High Street and period buildings and narrow lanes that run off it. It’s packed with all sorts of shops, cafés and restaurants. Alongside the big brands like M&S and Dorothy Perkins, there are lots of quirky little independents. There are also plenty of great places for eating and drinking, including - The Maldon Smokehouse, which has fabulous views over the river. Or, if you like a good old-fashioned pub there’s The Jolly Sailor in Heybridge Basin and The Jolly Sailor at Hythe Quay. In the high street there’s Prezzo's, the Rose and Crown and Dante’s for fine dining. A little further out of town is the award-winning gastro pub - The Bull at Gt Totham, which is well worth a visit. In fact, Maldon is packed with great things to do – there’s bowling and skating at Madison Heights. There’s Blackwater Leisure swimming complex and the ever-popular Splash Park. For those who like their culture, you’ve got the Thomas Plume Library and its 8,100 books. There’s also the Maldon Festival of art, music and dance, not forgetting, of course, the fabulous annual Maldon Mud Race. If you’re keen on open spaces, you’ll not be disappointed, either. There’s Promenade Park in town and, in the surrounding countryside, the choice is endless, from the Dengy National Nature Reserve to Tollesbury Wick and the many nearby villages, which include Langford, Woodham Walter, Ulting and Heybridge. On a more practical level, Maldon is great for families, with a good selection of schools and Maldon Primary School, The Plume School and Wentworth Primary School were all rated good at the last Ofsted inspection. The town’s inhabitants are a healthy mixture of young professionals, families and retirees and so there is a good range of properties to choose from. In places such as Silver Street and Victoria and Wellington Roads you’ll find plenty of period homes. If you are after a coastal view, you should take a look at the Hythe area, which has lots of 20th century cottages. There are also a number of housing estates, including the Poets Estate to the south of town. To the West is the Viking Estate. Some of the newest developments, such as Lightermans Place, tend to be to the south of town. Prices are very reasonable, especially when compared to London, which makes it very popular with commuters. According to the Land Registry, the current average price of a property in Maldon is £334,968. In London it’s £482,241. That’s a saving of just under 31%. More specifically, you’ll pay around £170,000 for a one bed flat. Two bedroom houses start from £200,000. A three bedroom cottage will set you back £265,000 (depending on its condition) and a typical three bedroom house will cost slightly more at roughly £300,000. If you go further out of Maldon, into the villages, you’ll get even more for your money.